The NE Buttress of Slesse is a long and classic climb up a very intimidating mountain and draws climbers from all over the Pacific NW. 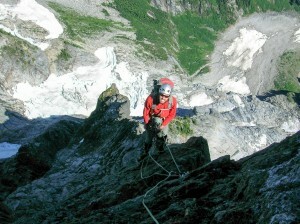 Rated 5.9 with up to 25 pitches, apparently most climbers either bivy on the way up or on the descent. I’ve always wanted to bivy on a small ledge halfway up a climb at least once and Veronika had similar aspirations, although neither of us relished climbing with a heavy pack. However, most of the year, the climb is guarded by a very scary pocket glacier, full of crevasses and collapsing seracs, that has killed climbers in two separate incidents. This pocket glacier periodically slides off the mountain, making the approach much easier and safer. When we received a report that it had slid in early August, we immediately resolved to do the climb and began watching for a good weather window. Our plan was to do an evening hike into the memorial bivy, stash some gear here in the morning, bivy again halfway up the route, summit the next day and do the crossover pass descent and hike out that same day. The NE Buttress of Slesse (5.9, 20-25 pitches TD). We waited two weeks for good weather and started from Vancouver at 4pm on a Monday. My hatchback civic isn’t great at crossing water bars, so we hiked the few extra kilometres to the trailhead. We met a group of three from Oregon on their way out. They told us that it had rained heavily the day before and that they were going to wait an extra day for the route to dry out. 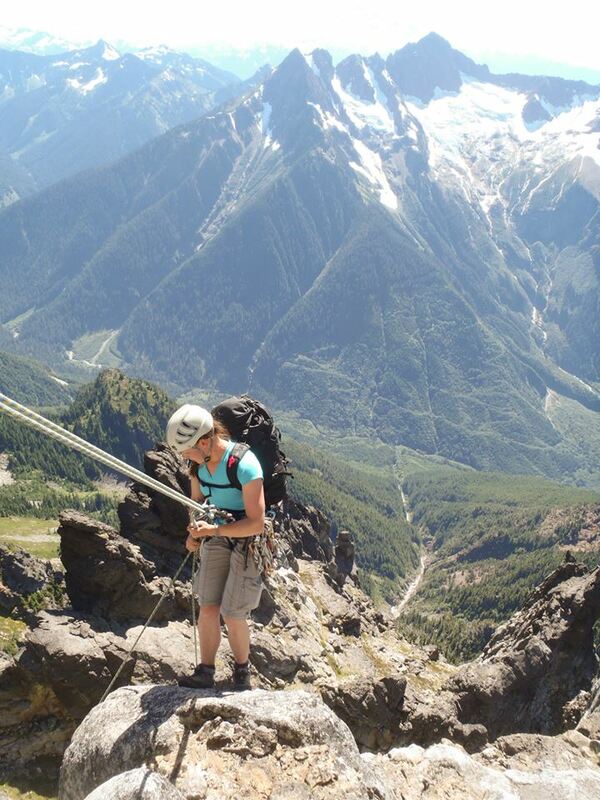 We told them we were Squamish climbers and that we were used to such things. We arrived at the memorial bivy at dusk quite wet from pushing our way through soaked vegetation along the trail most of the way. We set up our tent and quickly crawled into our warm sleeping bags for the night. There was one other pair of climbers bivied here who planned on climbing the route in a day, thus were planning an early start. We would have the route to ourselves. We stashed some gear and were moving again by 7AM. 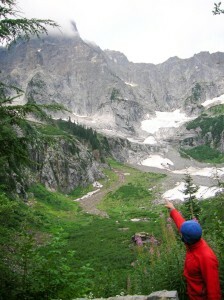 Slesse was enshrouded in clouds, but with promises of good weather, we started up the wet trail with high hopes. We were uncertain if we would find water on the route and so we packed up 9L between the two of us. This proved more than enough, but I’ve very unpleasantly ran out of water on long routes before and wasn’t planning on repeating the experience. 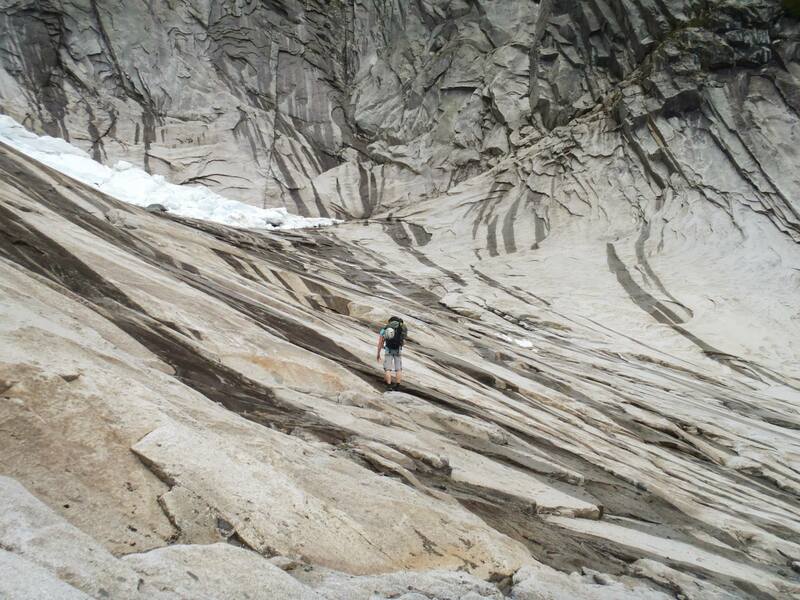 Crossing under the remnants of the pocket glacier to the approach ramp. We were soon crossing the remnants of the pocket glacier. There was still some hang-fire above the slabs threatening to let loose at any moment, so we did not linger long here. We stopped for a short break before the 4th class ramp leading to the ridge. Once on the ridge proper, we soloed up the first few pitches of 4th and low 5th to the first pitch of 5.7 where we roped up. 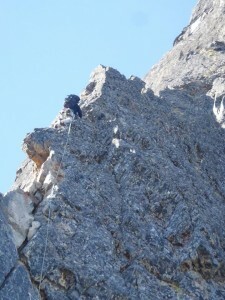 Two pitches brought us to the point where we would cross over to the North side of the ridge. At this point there was a very loud crack-crack-boom from below. I peaked back over the ridge as an avalanche of snow and ice crashed down the slabs we had crossed only an hour or two earlier. From this point on, the mountain came to life, calving off pieces of glacier and releasing avalanches of rock down its many gullies. 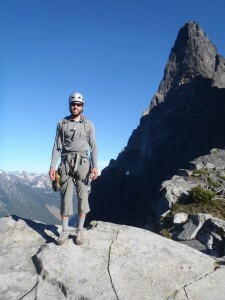 The rock on the route was dry, but there were many grassy cracks and ledges along the way which were wet and muddy. The next few pitches, while not technically hard, were made a bit challenging by sparse protection, wet muddy shoes, and heavy packs. 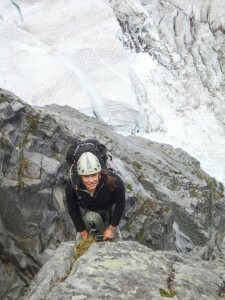 Veronika lead the last 5.8 “strenuous layback” to the bivy ledge. While done for the day, looking up at the rest of the route towering above us was quite intimidating. Looking over at crossover ridge, we spotted the other pair of climbers on their way down and gave them a wave. 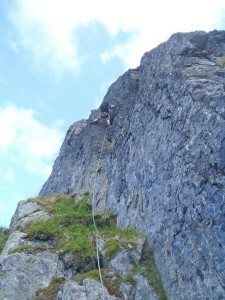 Veronika leading the 5.8 layback just below the bivy ledge. 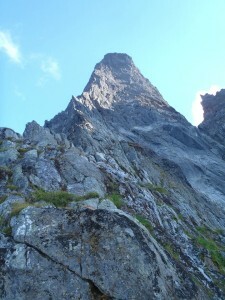 Looking up at the rest of the route from the bivy ledge. The bivy ledge was quite deluxe with a nice flattened area big enough for two to sleep comfortably and lots of space to splay out our gear. We had a relaxed dinner and prepared for a night under the stars. Veronika brought a 3/4 length sleeping pad, but I slept on the rope. I do not recommend this. We were both happy to have brought our emergency $15 bivy sacs as they added substantial warmth and kept the dew off our sleeping bags, although sleep did not come easy as thoughts of what was to come raced through our minds. The mountain asserted its indifference by periodically jolting us awake with the thunderous roar of collapsing seracs below. This nicely laid-out rope for sleeping was both uncomfortable and cold. I am smiling because I don’t yet realise this. 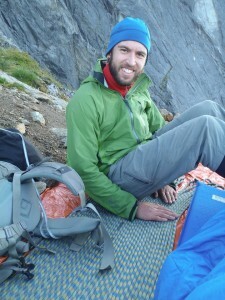 We awoke at first light and started to shuffle around our bivy ledge to warm up. We ate, packed up, and were climbing by 6:40AM. We simulclimbed up the next long section of 4th and low 5th in two long pitches and were soon at the base of the headwall pitches. From here, the rock kicks back and becomes much cleaner and the climbing more sustained and fun. The route stays very close to the ridge proper and gives fantastic exposure. Veronika unknowingly climbed the “troublesome vertical 5.8+ face” thinking that we were lower on the route. We were stoked to figure out that we were higher on the route than we thought and I led up the next 5.7 pitch to the base of the 5.9 crux. This next pitch was by far the raddest of the route and climbs a series of amazing detached vertical flakes before climbing through a small notch in a roof above. From here it was another 5 pitches of fun 5.7-5.8 climbing to the summit. We didn’t waste much time here, even forgetting to take a summit picture, and we were on our way down by 2PM. 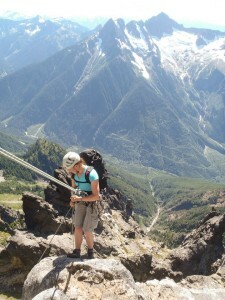 Veronika climbing onto a nice belay ledge the next morning. Veronika leading a 5.8 on the final headwall. Looking down the buttress. The bivy ledge is on the very tip of rock to my left. 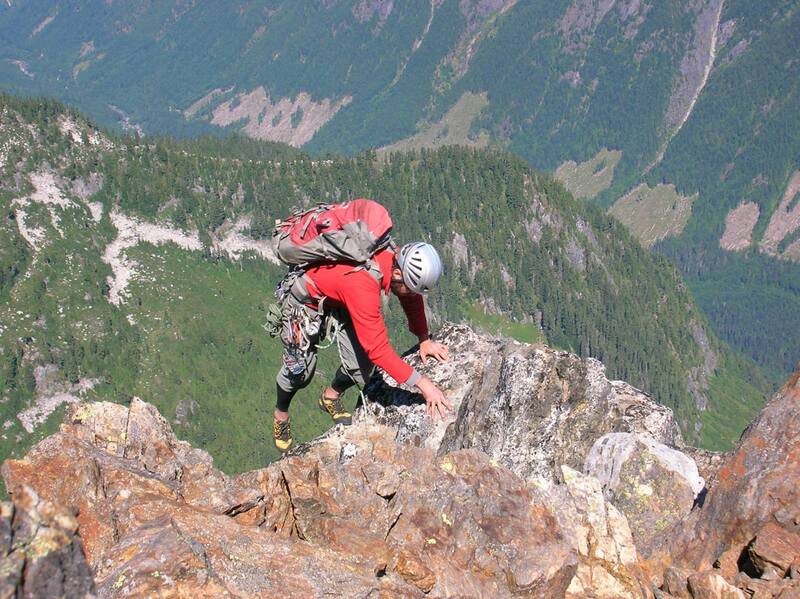 The crossover pass descent was long and involved many rappels and much unpleasant down climbing of loose gullies and unstable scree/talus fields. We did this in approach shoes, but it was not fun. The sun set as we were descending the last talus field before heading into the woods. Fortunately, the moon was full and the weather was clear. We spotted headlamps from the group of three climbers we met on the way in. 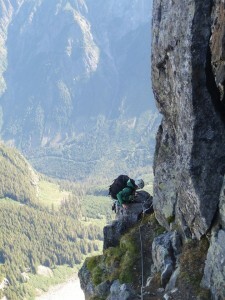 They were still 3-4 pitches below the bivy ledge and had seemingly underestimated the climb. We were glad not to be in their position. Looking back at the route on the skyline. 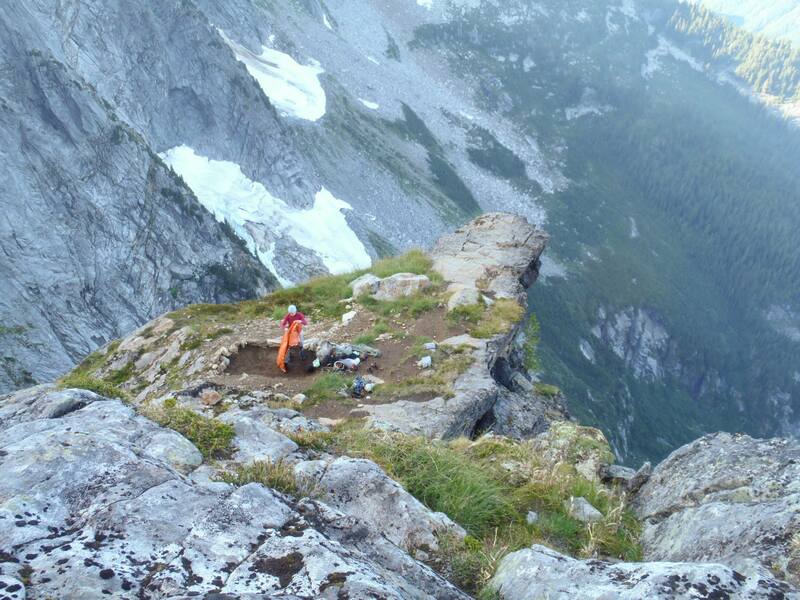 The bivy ledge is just left of the tiny snow-patch. The next instruction on our descent topo told us to head left into the forest where to would eventually find some flagging and the trail down. The description doesn’t say when to head left and we ended up entering the too high, bushwhacking through the forest in the dark and arriving at several dead-end cliffs. At this point, we were getting tired and loosing hope of finding the trail in the dark. We contemplated bivying another night and finding our way down in the morning, but we decided to give it one more try. We bushwhacked back to the talus field, bushwhacked back into the forest a bit lower and were ecstatic to spot the first bit of flagging. From here, we plodded down the steep trail and arrived back at the memorial bivy at 11PM where we grabbed our stashed gear and continued down the trail. At this point we were thoroughly exhausted and I prefer to forget the next 3 hours of death-marching back to the car. We took a quick nap before driving back to Vancouver where we both crashed for the rest of the day in our warm and very comfortable beds. 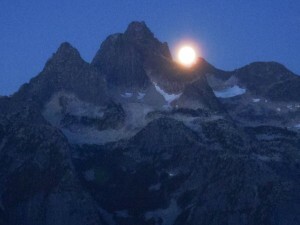 The full moon rising over Rexford. 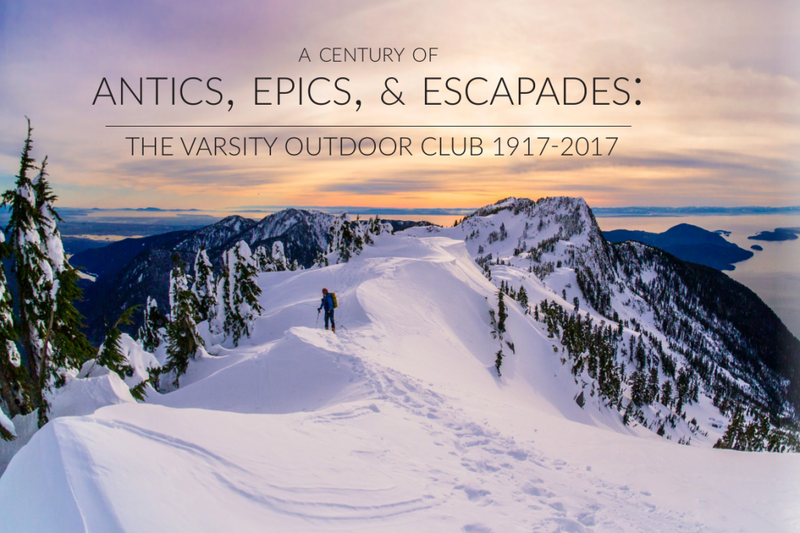 This entry was posted in Climb, Trip Reports and tagged Climb, climbing, dry, Face, flagging, Glacier, hike, Hope, instruction, leading, Oregon, ridge, Snow, Squamish. Bookmark the permalink. Awesome! Great photos and captions. That Crossover decent is a mean finish. All things considered, I think you managed to do it in a decidedly non-epic way (in a good way). Well done. Thanks! 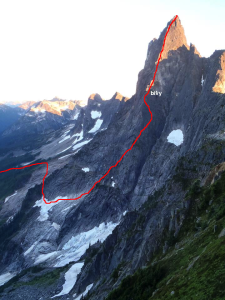 I was looking over at the North Rib and that route looked much more sustained and our descent was mostly snow free, so I’m sure those factors helped. We also avoided sketchy night climbing by arriving at the bivy early. Looks positively epic. Great trip report. Nice one. So is the crossover pass descent the one that comes down the same side you went up? It is indeed. I heard that the other side is now gated, so the crossover pass descent is now standard. 1. Best Slesse photos I’ve yet seen. Sounds like a great trip Todd. I also climbed Slesse this summer, amazing route!